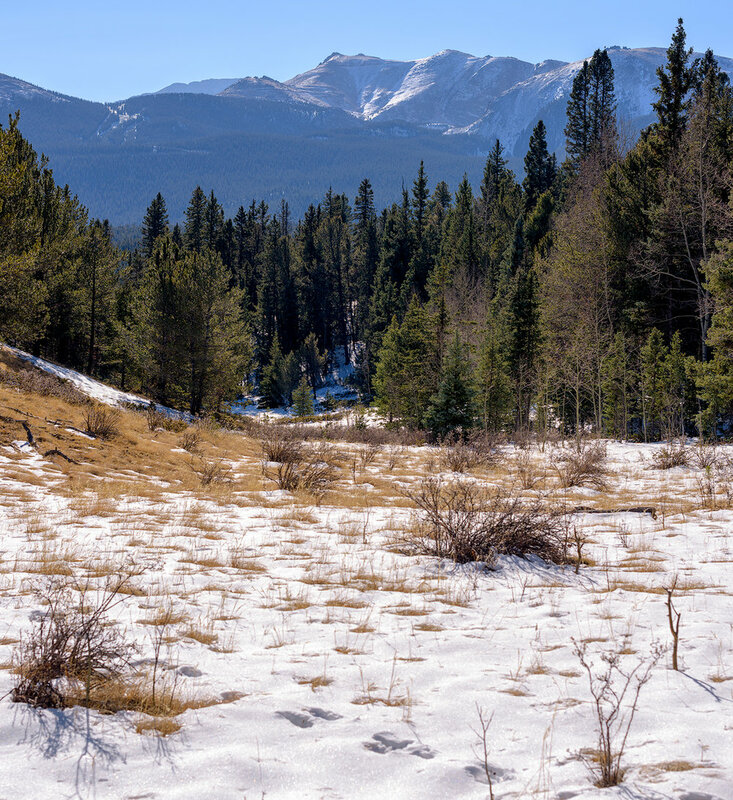 Elder-Fehn Trail winds through dense forest along the border of the Catamount Ranch Resource Protection Area, and showcases sensational views of Pikes Peak. It’s a little more difficult than a simple walk in the woods, so get ready to earn your outdoor hike. The parking lot for the Elder-Fehn Trail is situated outside the entrance for the Catamount Center for Environmental Science & Education…wow, that’s a mouth full. There isn’t a ton of space available, but that’s true of most popular hiking spots. Like most hikes, you’ll be right off into a climb. Even though the trail starts with a climb, it’ll soon work its way down...and then up again...and back down. This up and down will happen a lot on this trail. So get ready to work those leg muscles. The elevation gain/loss isn’t dramatic, but it does get the ol’ heart a pumpin’. 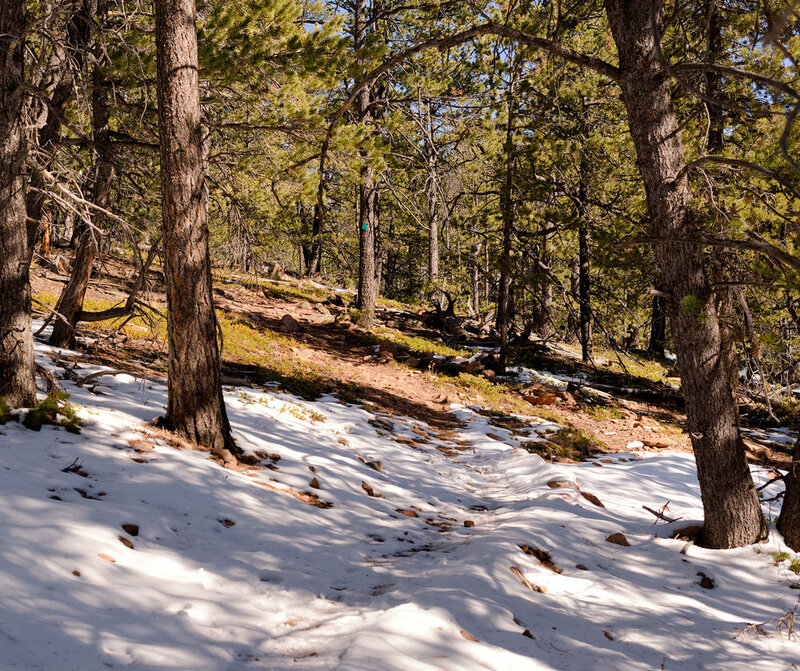 The majority of this trail is well shaded, and perfect for a cool, afternoon summer hike. It’s also great during winter months since the shade of these same pine trees keeps that Colorado sun from melting all that glorious, glorious snow. It won’t take log to find several signs marking the edge of the Catamount Research area. It’s important to keep on the trail, and to not walk off into the research areas. This will insure the environment remains undisturbed and intact. Elder-Fehn Trail is almost an out-and-back hike, but there is an added 1.5 mile loop near the end. This gives the trail a balloon, or lollipop map profile. If you’ve missed a scenic spot on the way up, you’ll get a chance again on the way down. The eagle-eyed observer might recognize some familiar rock formations too; The Crags. If you’ve never visited The Crags (it’s more fun if you say it with a Scottish accent), check out my blog post here. 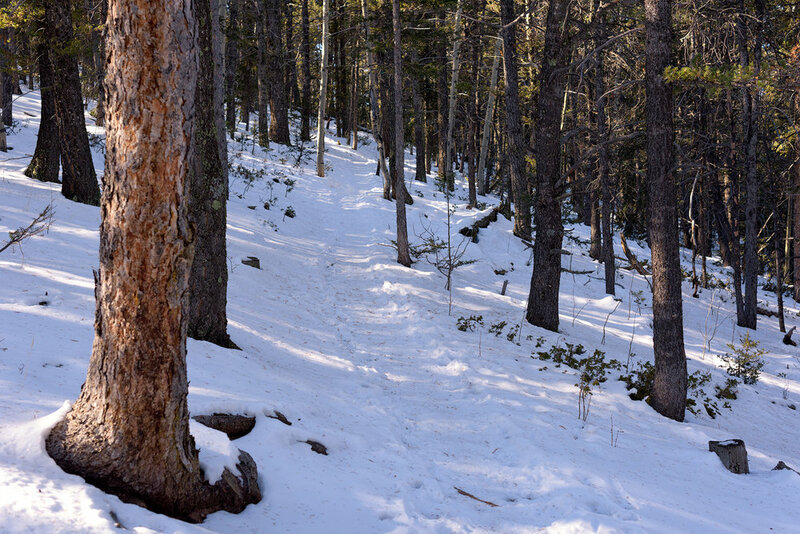 I was lucky enough to hike on a snow covered trail. If you’ve never hiked in the snow before, it’s a lot of fun. The snow was packed down by other hikers, so I didn’t need snowshoes, but I did throw on my ICEtrekkers to help with all the elevation change. The sun has cleared parts of the trail, and some spot where a little icy, so my boot chains helped a lot. Since there had been several other hikers on the trail before me, It was easy to stay on the right path. But even if I was the first one on the snow, I’d know where to go. 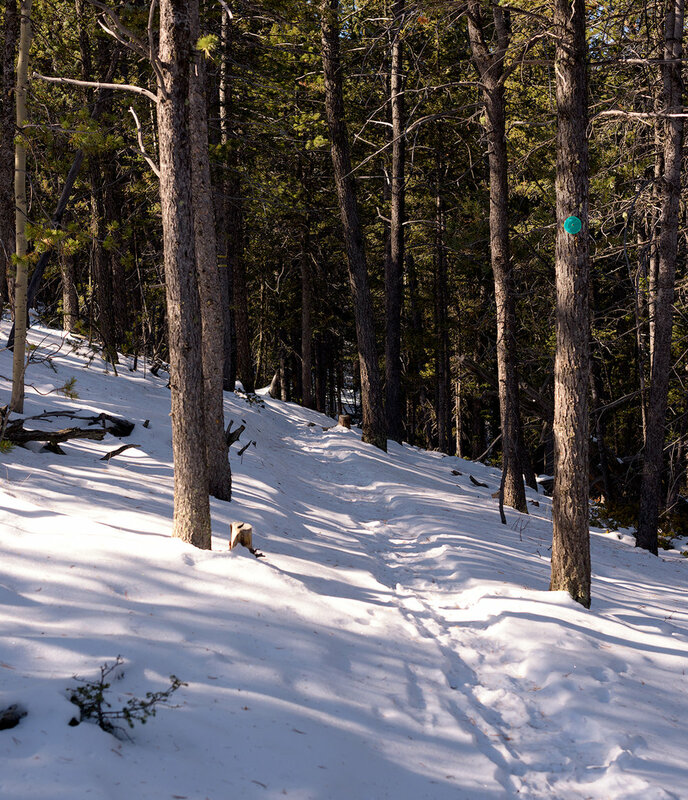 There are some helpful trail markers spaced about every 20 to 30 yards. Look for round, green reflectors placed on tree trunks all along the trail perimeter. Look about six-eight feet high on a tree and you should see one. Eventually I arrived at the junction for Vayhinger Trail. There is a large trail map (like at the parking lot) showing this spot. From the junction, continue climbing up another quarter mile-ish to the start of the loop. I kept to the right, and followed the loop in a counter-clockwise direction. The 1.5 mile loop follows a wider trail (old service road? ), and maintains a slight elevation gain. Once the trail starts its descent, it won’t be much longer until I reached the loop starting point. The return trip offers the same great views of Pikes Peak, and another chance to work those leg muscles some more. While the snowy conditions I experienced helped limit the number of people on the trail, it’s still a popular hike. Elder-Fehn is long enough to get a good bit of exercise, but isn’t too long for the kiddos. Hiking is definitely the most popular trail use, but Trail Running, and Mountain Biking are also great ways to experience the area. It’s a moderately difficult trail (due to all the elevation change), but a good trail for most experience levels.